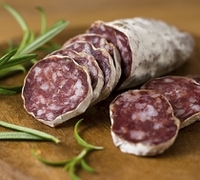 24 Jul 2018 --- An Johns Hopkins Medicine analysis of more than 1,000 people with and without psychiatric disorders has shown that nitrates – chemicals used to cure meats such as beef jerky, salami, hot dogs and other processed meat snacks – may contribute to mania, an abnormal mood state. Mania, a state of elevated mood, is characterized by hyperactivity, euphoria and insomnia and is generally seen in people with bipolar disorder. The researchers say that their new study adds to evidence that specific diets and potentially the amounts and types of bacteria in the gut may contribute to mania and other disorders that affect the brain. The findings of the study, which was not designed to determine cause and effect, were published in Molecular Psychiatry. Specifically, it found that people hospitalized for an episode of mania had more than three times the odds of having ever eaten nitrate-cured meats than people without a history of a serious psychiatric disorder. Between 2007 and 2017, as part of an ongoing study, Yolken and colleagues collected demographic, health and dietary data on 1,101 individuals aged 18 through 65 with and without psychiatric disorders. Approximately 55 percent of the participants were female and 55 percent were Caucasian, with 36 percent identifying as African-American. A study of their records between 2007 and 2017 showed that, unexpectedly, among people who had been hospitalized for mania, a history of eating cured meat before hospitalization was approximately 3.5 times higher than the group of people without a psychiatric disorder. Cured meats were not associated with a diagnosis of schizoaffective disorder, bipolar disorder in people not hospitalized for mania or in major depressive disorder. No other foods about which participants were queried had a significant association with any of the disorders, or with mania. To get at the roots of the association, Yolken collaborated with researchers studying the impact of nitrates on rats. When the group analyzed the gut bacteria of the different groups of rats, they found that animals with nitrate in their diet had different patterns of bacteria living in their intestines than the other rats. Moreover, the animals had differences in several molecular pathways in the brain that have been previously implicated in bipolar disorder. While the team cautions that it's too early to take any clinical messages from the results, and occasional cured meat consumption is unlikely to spur a manic episode in most of the population, Yolken says the findings add to evidence of the multiple factors that contribute to mania and bipolar disorder.